"Am I really all the things that are outside of me?" Sorry, no matches on eBay for "Out Of Control Pony Pony Run Run". 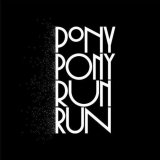 Sorry, no matches on iTunes for "Out Of Control Pony Pony Run Run".